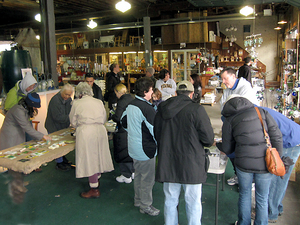 Posted on Tue, Mar 20, 2012 : 4:04 p.m.
Swap seeds and chat about gardening at the Project Grow Seed Swap on March 25 at Downtown Home and Garden..
Due to popular demand, Project Grow and Ann Arbor 350 are hosting a second seed swap this season on Sunday, March 25, from 2 to 4 p.m. at Downtown Home and Garden. Last month's seed swap was so successful, people requested another one! Bring your excess seeds and get something new to grow. It's also fun to chat with other gardeners and get some growing tips. You can bring any kind of seeds to trade: flowers, vegetables, herbs, annuals, perennials, shrubs, and trees, whether you collected the seeds yourself or have leftover seeds from packets you bought. Just make sure to label your seeds. Everyone is welcome. You don't need to be a Project Grow or Ann Arbor 350 member to attend. You also do not need to be a seed starting expert — people will gladly share growing tips! If you don't have any seeds to trade but are really interested in growing from seed, do stop by as there are usually extra seeds available. Check out a previous article for more detailed information on the specifics of swapping. See you from 2 to 4 p.m. on Sunday, March 25, at Downtown Home and Garden at 210 S. Ashley in Ann Arbor. What? A way for people to exchange the fruits of their labor without me taking half of it for administrative costs, such as 5000 dollar bottles of wine and yachts? Shut it down!